AMAZONAS May/June 2014 Cover. Click to enlarge. 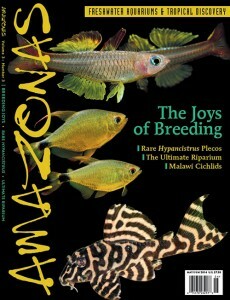 For the readers, contributors, and editors of AMAZONAS, a fascination with the breeding of aquarium fishes is a unifying passion. All of the efforts to feed better foods, maintain more pristine water conditions, provide better lighting and more appropriate space and system parameters have just a few goals: keeping fish healthier, more active and colorful—more inclined to reproduce. • In an extravagant gallery of species images, Haakon Haagensen looks at the astonishing range of target species for breeders captivated by the Zebra Pleco and its brethren in the genus Hypancistrus. Threatened with potential extinction by hydroelectrical damming projects in their Rio Xingu native waters, these boldly pigmented catfishes bring with them an imperative to be bred in captivity. • Planted aquarium expert Kris Weinhold continues his experiments with practical, affordable LED lighting sytems, including customizable and do-it-yourself options. • Riparium in the Mists: Devin Biggs offers a portrait of an astonishing riparium system created by Don Boyer in Nashville, Tennessee, with both above-water and below-the-surface tropical biotopes. • A Fishroom Visit with Shane Linder: Star expert on Planet Catfish, Shane Linder, welcomes writer Rachel O’Leary and AMAZONAS into his fishroom for a chat about his adventures—and misadventures—in breeding and seeking out catfishes off the beaten path in South America. Look to the next issue of AMAZONAS for fresh inspiration, new ideas and a cover-to-cover celebration of the joys of aquaristics.